Senko Ikenobo, the first female headmaster designate of Japan’s oldest school of floral arranging, will give a free presentation at Japan House and an ikebana (flower arranging) demonstration at Krannert Center for the Performing Arts. CHAMPAIGN, Ill. — Japan House at the University of Illinois will host two prominent cultural figures from Japan this month. Senko Ikenobo is the headmaster designate of the Ikenobo Ikebana School of Floral Art, the oldest school of floral arranging in Japan. 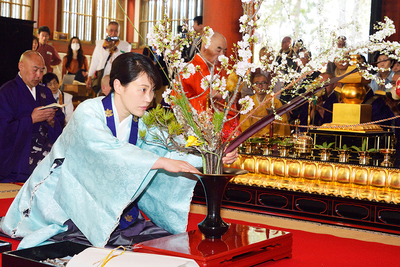 She is the 46th generation of the Ikenobo family, and she will become the first female head of the school in its 555-year history. She’ll be at Japan House’s fall open house Oct. 21, and she’ll do an ikebana demonstration at Krannert Center for the Performing Arts on Oct. 22. Noboru Fujinuma is a basket artist in Japan and has been designated a Living National Treasure of Japan, a title given to those who are important preservers of Japanese culture. Fujinuma will give a talk about his artwork on Oct. 25 at Japan House. “To have these two incredibly important figures in Japanese culture here at events that are free and open to the public is amazing. In Japan, people wouldn’t even have this access. It’s an incredible opportunity,” said Cynthia Voelkl, the assistant director of Japan House. The Illinois Prairie Chapter of the Ikenobo Ikebana Society of America applied to the Ikenobo school in Japan to have Senko Ikenobo visit for the chapter’s 20th anniversary. Each year, the headmaster and headmaster designate visit two chapters in the U.S. or Canada for a significant anniversary, said Jeanne Holy, president of the local chapter. Ikebana, or the art of Japanese flower arranging, began with the Ikenobo Ikebana School of Floral Art more than 550 years ago. The idea is not to recreate the shape a plant had in nature, but to express the distinct character and beauty of each plant, including the changes made to it by the forces of nature, such as wind or insects. The local ikebana chapter is a community group, not a U. of I. organization, but it holds monthly workshops at Japan House and participates in Japan House events. Ikebana, or the art of Japanese floral arranging, “is not just flower arranging, but also a philosophy and discipline, like judo or aikido or tea ceremony. There is a component that is very philosophical,” Holy said. The organization worked with Japan House to schedule public events for Ikenobo’s visit. Ikenobo will give a presentation that is free and open to the public at Japan House’s open house at 11 a.m. Oct. 21. The open house will also include tea ceremonies and garden tours. 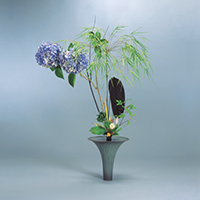 Ikenobo will also open an exhibition of ikebana floral arrangements in the foyer of the Foellinger Great Hall at Krannert Center for the Performing Arts. The exhibition opens at 5 p.m. Oct. 20 and goes through 9 p.m. Oct. 22. It is also free and open to the public. The local ikebana chapter will screen a movie – “Hana Ikusa,” or “Flower and Sword” – that tells the story of the Ikenobo school in the late 16th century. The movie, which is in Japanese with English subtitles, will be shown at 10 a.m. Oct. 22 at the Art Theatre in Champaign. Ikenobo will give an ikebana demonstration at 2 p.m. Oct. 22 at a ticketed event at Krannert Center. She will also be part of activities hosted by the local ikebana society chapter for its members and members of other chapters, including critiquing the work of students in a fall ikebana class. “It’s really a big honor. It’s very inspiring to have her here for our members,” Holy said. Fujinuma, the basket artist, will give a public talk on his artwork at 5:30 p.m. Oct. 25 at Japan House. It will be followed by a tea ceremony performed by Shozo Sato, the founder of Japan House and a professor emeritus of art and design. The event is free and open to the public. Fujinuma also is giving a sold-out Chabana basket workshop at Japan House on Oct. 24. 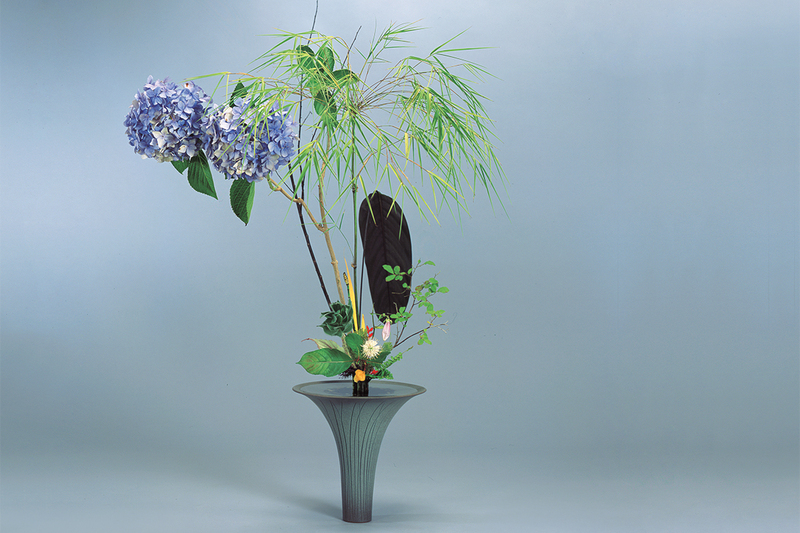 A Chabana basket is used to hold a flower arrangement created for a tea ceremony. Fujinuma is one of the most important bamboo artists alive, and his work will be part of an exhibition at the Metropolitan Museum of Art, “Japanese Bamboo Art: The Abbey Collection,” through Feb. 4. He’ll give a demonstration at the museum Oct. 22. His work was the subject of an exhibition at the Art Institute of Chicago in 2011, and he’ll speak at the Art Institute as well during his visit to the U.S.
Editor’s notes: For more information about the Japan House events, email Cynthia Voelkl at cvoelkl@illinois.edu or go to http://japanhouse.art.illinois.edu/en/. For more information about Krannert Center for the Performing Arts events, email Bridget Lee-Calfas at bklee@illinois.edu or go to https://krannertcenter.com/.